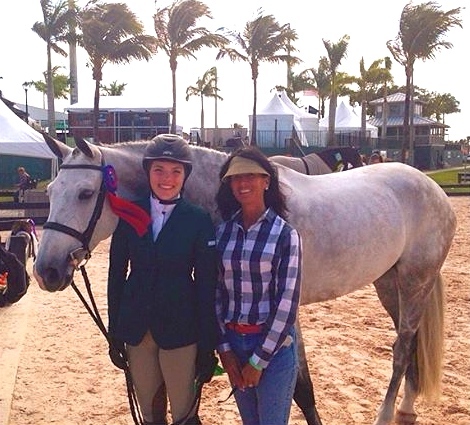 Caitlin Creel and Davinci at the American Invitational in Miami. Photo by Sportfot. 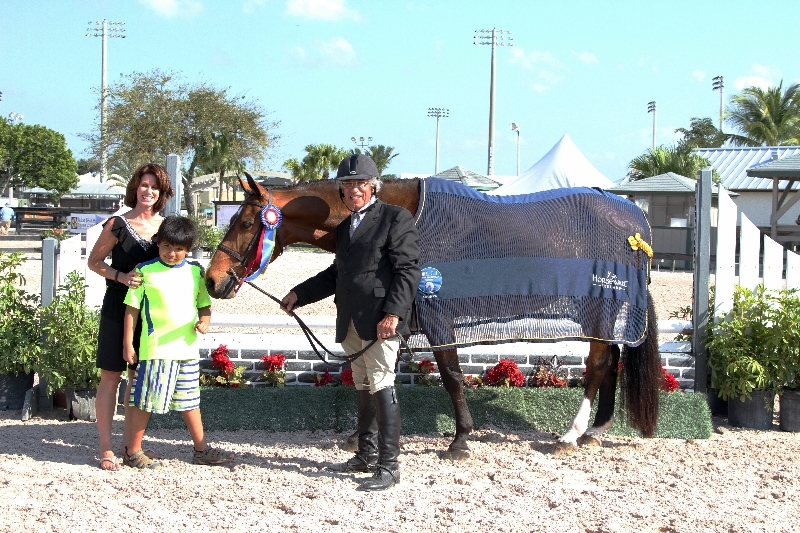 Elgin, IL – April 24, 2014 - Lynn Jayne’s Our Day Farm tallied up their blue and tri-colored ribbons as they wrapped up twelve weeks of the Winter Equestrian Festival (WEF) in Wellington, FL. Jayne, of Elgin, IL and her customers have made it a tradition to escape the Chicago winters and call Wellington “home” for three months. Jayne’s preparation at home prior to the circuit allowed customers to hit the ground running, wasting no time acquiring the blues. Lynn Jayne celebrates the Circuit Championship with daughter, Natalie and Malibu. Ten-year-old Natalie Jayne was Circuit Champion in the Small/Medium Children’s Pony Hunters on Malibu. Malibu is a 13-year-old New Zealand warmblood owned by Camille Trimble of Westlake, TX. Young Jayne also won the Children’s Pony Classic one of the weeks and won the WIHS Pony Medal the same week with a high score of 88. During the circuit, Jayne and Malibu jogged in the top two spots in multiple classes and were Champion and Reserve Champion several times, earning them the high score in the division for the circuit. Steve Martines and Bitelli accepting their Championship in the Low Adult Hunter Division, pictured with son Clayton and daughter Julie. Photo by Anne Gittens Photography. Steve Martines of Lafox, IL earned a Championship in Low Adult Hunter division on his Oldenburg gelding, Bitelli. Martines has been a customer of Jayne’s for years and has been a winner with multiple horses in Jayne’s program. Martines’ son, Clayton, participated as well. Riding Clovercroft Show Me the Bunny, the younger Martines was 6th in his first pony medal class and won ribbons on Jumping Jack Flash in the Small/Medium Children's Ponies. Another adult rider, Kim Calamos of Batavia, IL also brought home several top ribbons and a blue in the Low Adult Hunter division aboard Washington Square. Keeping it in the family, daughter Kaitlyn Calamos and Tuxedo, walked away with the Championship in the Low Adult Jumpers 18-35 and won the $1,500 Low Adult Jumper Classic in week two. Continuing the winning streak, Calamos, 20, of Batavia, IL, also won the classic again in week 3 and the Reserve Championship in the division. Junior rider, Olivia Lawton, 16, of Burr Ridge, IL also found her way to the winner’s circle. It was Lawton’s first time moving up a division from the Children's Hunters to the 3'3 Junior Hunters and she proved she was ready by bringing home a blue along with other top prizes. Lawton’s mount, Granit, a seven-year-old Warmblood, was imported from Europe in 2012 as a Grand Prix prospect. Lawton is new to the Our Day program but has had her horse since last March and says he is a horse that loves his job. Olivia Lawton and Granit pose with Lynn Jayne after earning a blue in the 3'3" Junior Hunters. 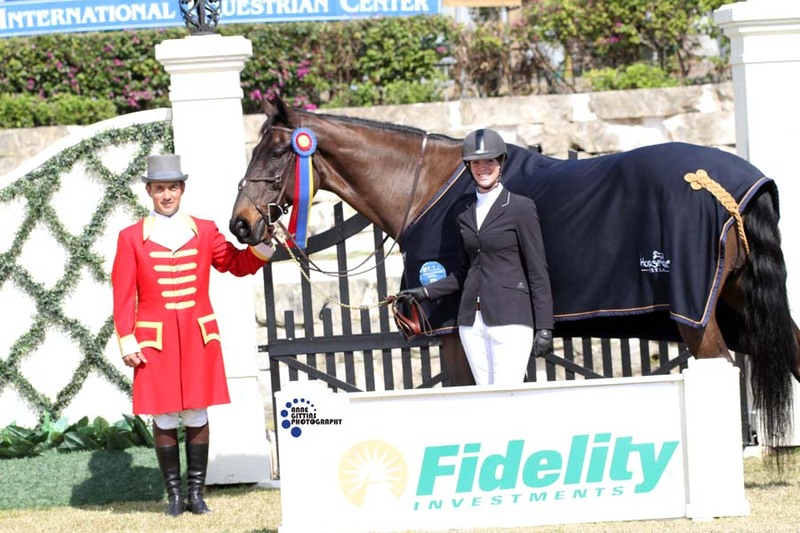 Caitlin Creel, 17, of Kildeer, IL, one of Jayne’s big winners, clinched the blue in the $10,000 Low Junior Jumper Classic in week three of the series aboard DaVinci, owned by Cavallo Farm of San Diego, CA. Creel and the 12-year-old Dutch warmblood gelding also took home the Reserve Championship in the division. Junior rider, Creel had a very successful WEF winning ribbons in the very competitive ASPCA Maclay Medal and the USEF Medal on Confession. The highlight of the circuit for Creel was getting to ride in the American Invitational in Miami at the home of the Miami Dolphins in Sun Life Stadium. Riders are invited to compete based on prize money won. Jayne and her customers will continue to show at both local and national horse shows in the Midwest during the summer.